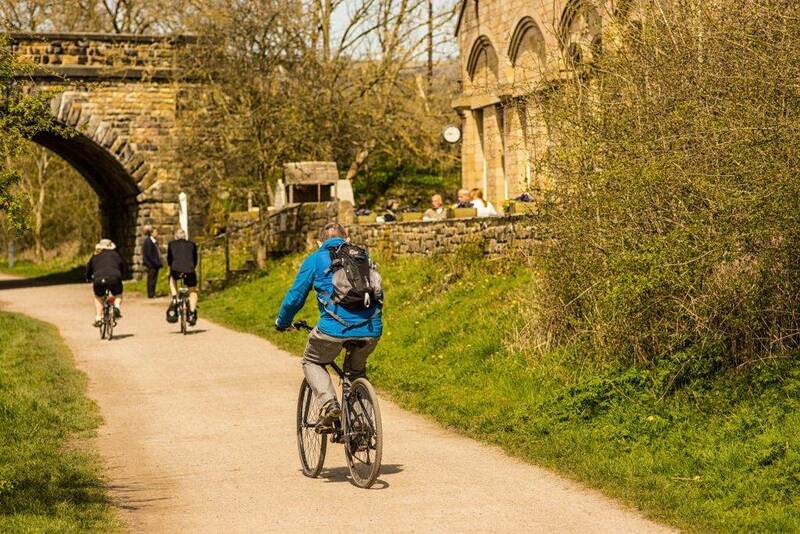 The Monsal Trail is a traffic-free path running for 8.5 miles between Combs Road in Bakewell and Blackwell Mill in Chee Dale, in the heart of the Peak District National Park. The path follows the former track of the Midland Railway Line, constructed in 1863 to link Manchester and London. 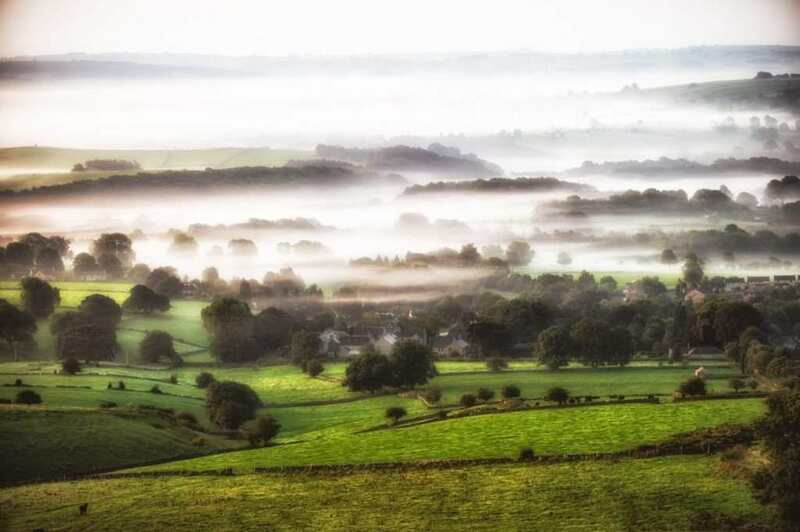 Its route ran through the beautiful Wye Valley on the orders of the Duke of Devonshire, who refused permission for the railway to run through his land close to Chatsworth House. The railway closed in 1968 and was converted into a pedestrian trail in 1981. 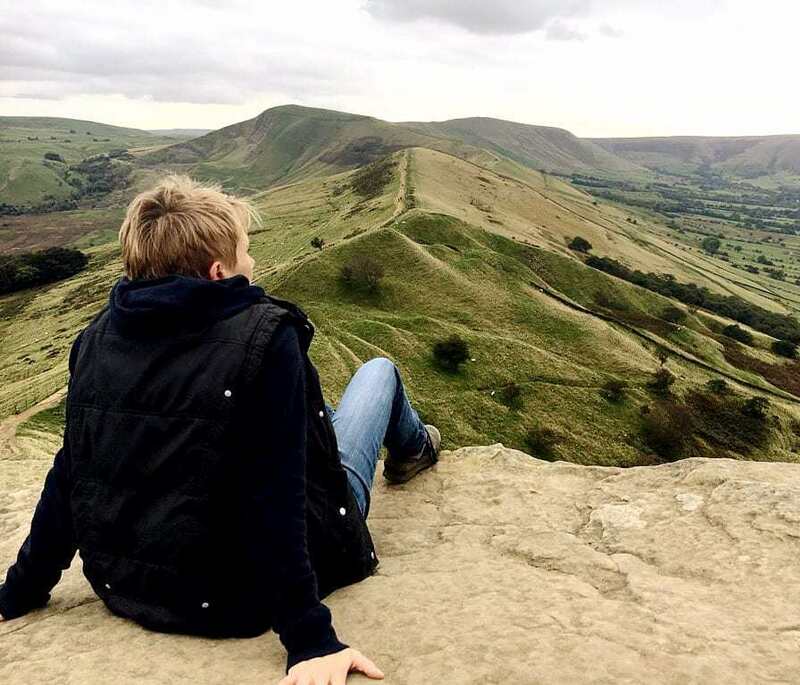 The Monsal Trail passes through the most stunning White Peak scenery, running close to villages and settlements at Blackwell Mill, Millers Dale, Cressbrook, Monsal Dale, Great Longstone and Hassop on its route from Bakewell to Chee Dale. The Monsal Trail runs through six old railway tunnels, all fully opened and lit during daylight hours: Headstone Tunnel, Cressbrook Tunnel, Litton Tunnel, Chee Tor Tunnels 1 and 2 and Rusher Cutting. Some are almost half a kilometre long and curved, meaning that it is impossible to see the daylit opening from the start of the tunnel, adding to the excitement of exploring! Be warned that if you visit and intend to go through the tunnels after dusk, take a torch! There are many entrance points to the Monsal Trail along its route – see the map below. It is flat, level and well-maintained, perfect for walkers, runners, horse-riders, cyclists and wheelchair-users. There are wheelchair-accessible ramps at Bakewell Station, Hassop Station, Great Longstone Station and Millers Dale Station. 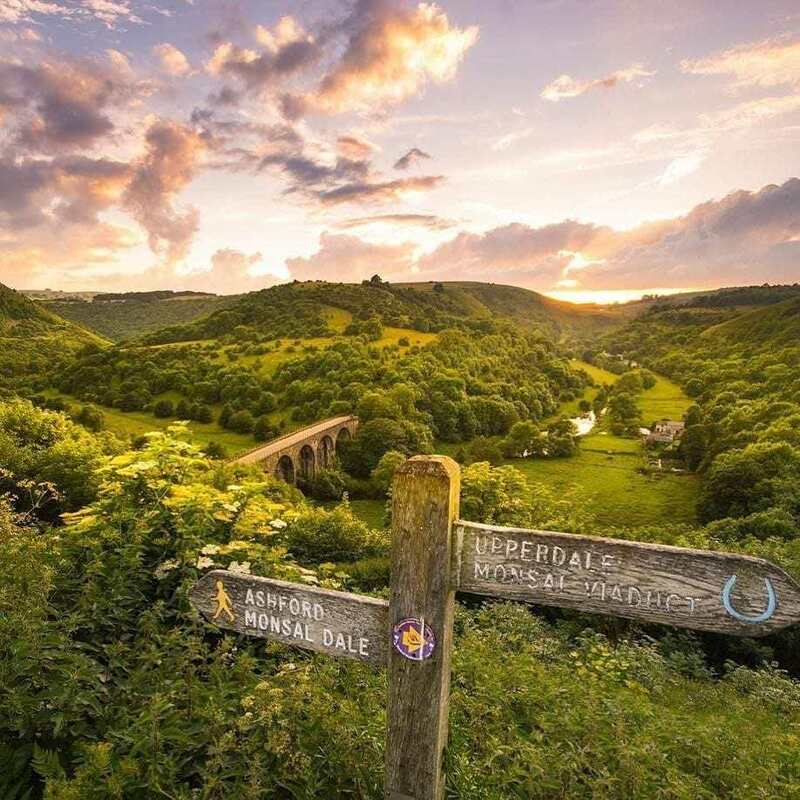 A picture-perfect structure, spanning the beautiful River Wye, the Headstone Viaduct is an impressive sight from anywhere surrounding the Monsal Trail. It is 300 feet (91m) long, with five 50 feet (15m) arches, and is 70 feet (21m) high at its highest point. 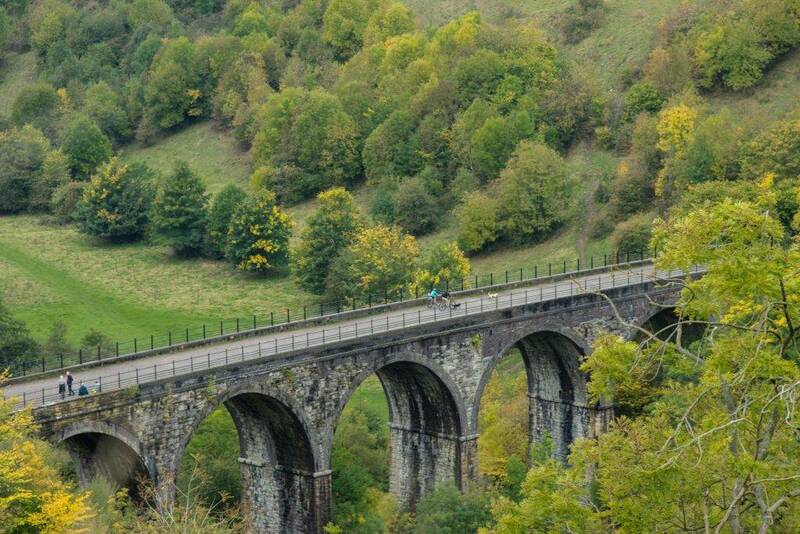 From the Monsal Trail itself it also provides a perfect aerial view along the Upper Wye Valley. His words are displayed on the viaduct today. 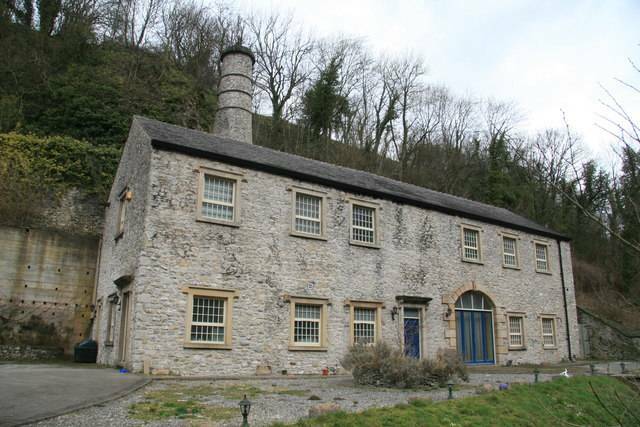 Cressbrook Mill was a thriving cotton mill in the 18th and 19th Centuries, powered by water from the river. The first mill building, constructed for Sir Richard Arkwright, was opened in 1783 but was destroyed by a fire soon afterwards. Its replacement was built in 1812 and had two large water wheels, used until steam replaced water power in the 1890s. Cressbrook Mill continued operating as a working mill until the 1960s. It has now been converted into residential accommodation. Litton Mill was opened slightly before its counterpart at Cresswell, in 1782. It too was a textile mill powered with water from the River Wye. Litton Mill became notorious for the cruel treatment of the pauper children who worked there during the Industrial Revolution under the mill owner, Ellis Needham. Tragically, many children died as a result of their experiences there and are buried in local churchyards. The original mill building was subject to a number of economic and structural disasters, including a serious fire and damage to the water wheel. By 1815 Ellis Needham was bankrupt. The mill was taken over by another owner but another fire destroyed much of the building in 1874. Very little of the original building still stands. A number of old lime kilns are evident on the Monsal Trail close to Millers Dale Station, and are very interesting to explore. The kilns were used from the 19th Century until 1944 to produce quicklime, used as an agricultural fertiliser.